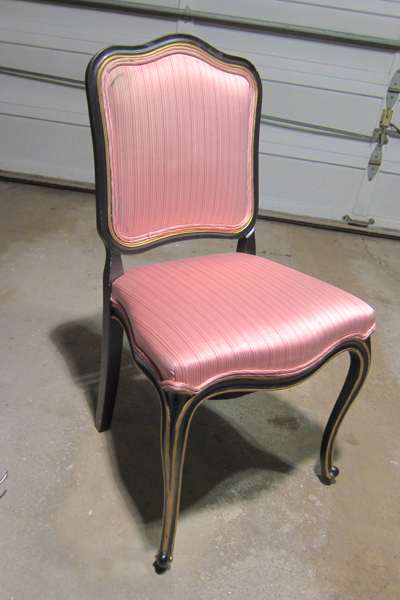 I liked the lines, and I didn’t even mind the slipper pink fabric and gold trim. I mean, I love tacky stuff, right? But this was cheap and in bad shape so I didn’t care if I messed it up. It was like $7 at an estate sale. Shoddy paint job? Eh, I knew I wasn’t going to keep it. So I stripped it, carefully keeping the interior layers (I probably put it back together wrong anyway because I’m clueless). 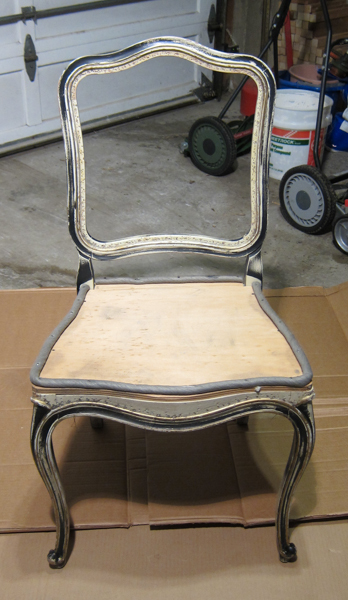 And then I lightly sanded it. 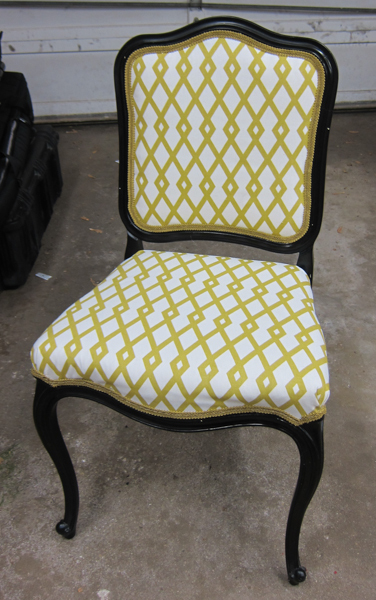 I probably could have done a better job sanding but I was more interested in the fabric in all honesty. 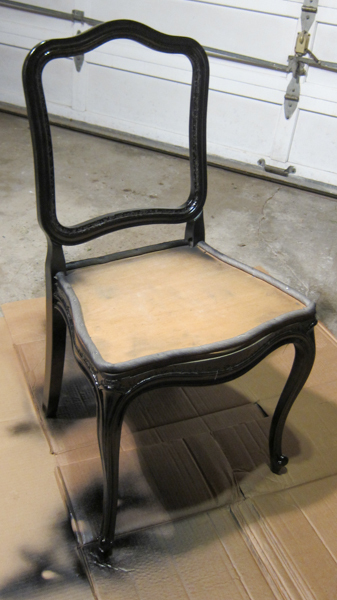 Then I spray painted the chair black. And then the chair sat in the basement for about six months collecting broken dreams. 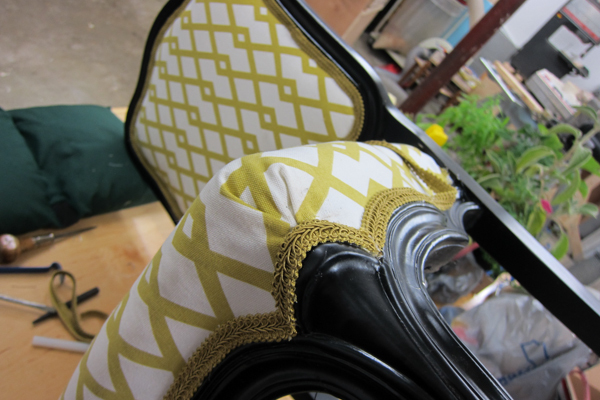 I thought I was going to do double welting as the trim because that’s how it came to me. So I felt like I needed to learn how to make welting. That’s a long side project/story that is pointless here because, after I got going? I realized I’d rather just have gimp trim! Dale set me up with an awesome work station in the garage–on a table he built that he hasn’t given me pictures of. He’s done a bunch of impressive projects that I can’t show you until I get pics from him. I used a traditional heavy duty stapler and that seriously and totally SUCKED. 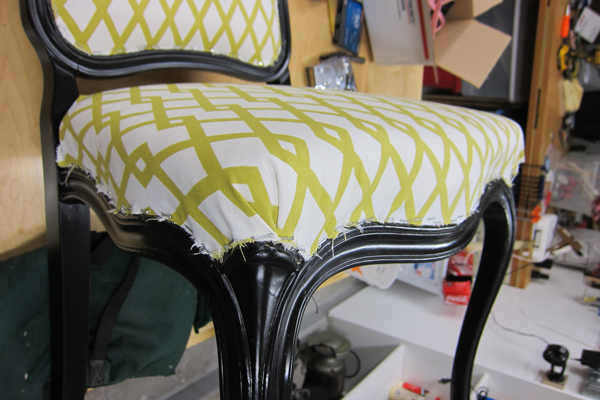 I really need an upholstery stapler if I plan to get serious about these projects going forward! 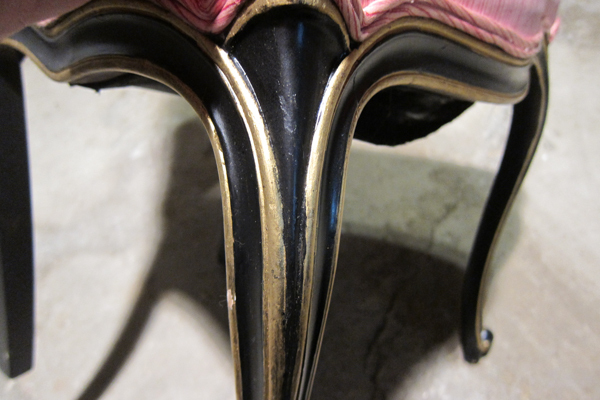 It also kinda ruined the chair (which was my fault and nobody can really tell unless I point it out but still). 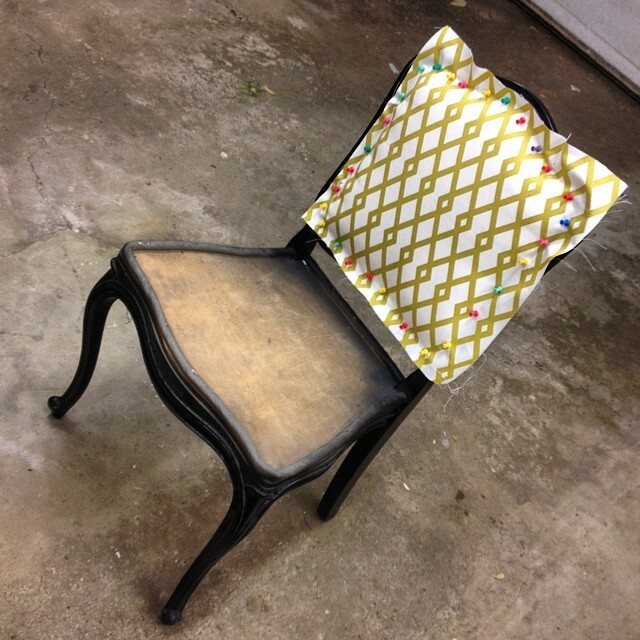 Get a real upholstery stapler. That’s my biggest piece of advice for newbies like myself. 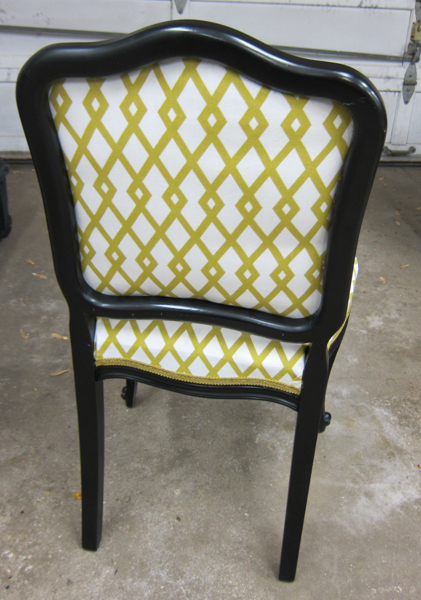 Trying to position the pattern within the frame of the chair was a challenge. I pinned it first and then stapled. And THEN I trimmed the fabric. Probably a terrible idea. Probably destroyed the cutting tools I used. Live and learn, eh? 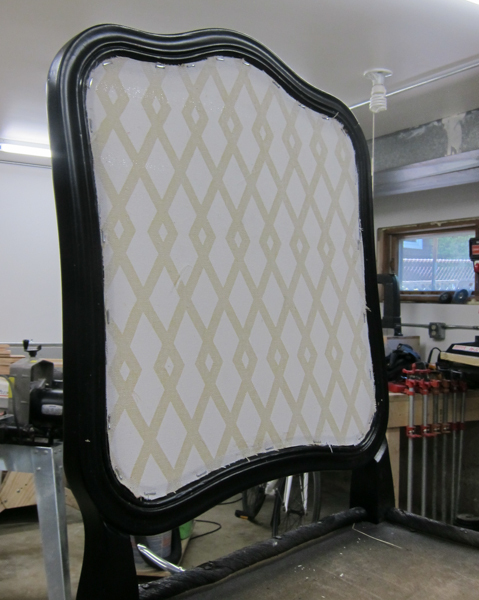 Put the existing padding in just as it had been before (that was actually in great shape). And pinned the front to get my staple on. Ugh, my hands were tired! You can see some of my shoddier attempts at cutting the fabric here. I literally have no idea how I should have done it. I’m going to have to do more reading next time. Heh. I also winged it with folding the fabric over the corners. The book I had didn’t address that style. 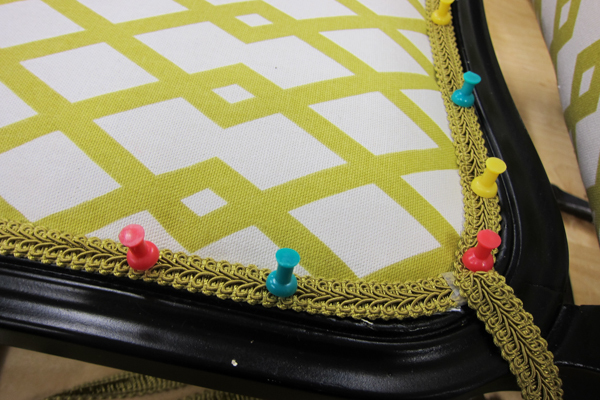 Finally, I got to the part that I’m good at: using my glue gun! 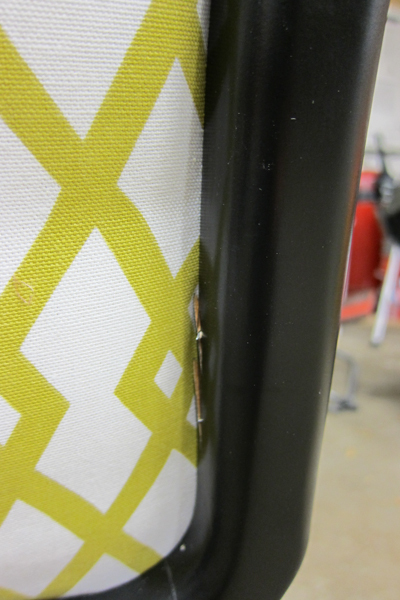 I pinned the gimp (that’s the edging) all along the fabric to cover up all my most egregious screw-ups. 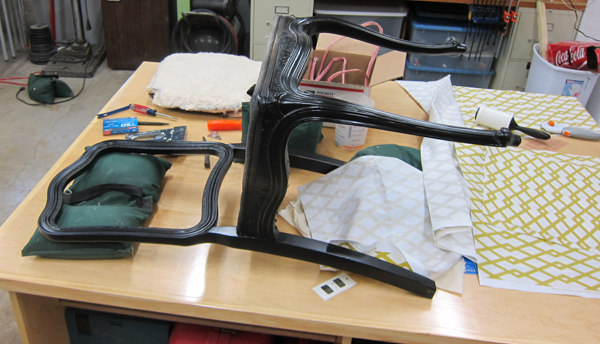 Then I used my hot glue gun to glue down several inches at a time, careful to shape the gimp as I moved around the chair. 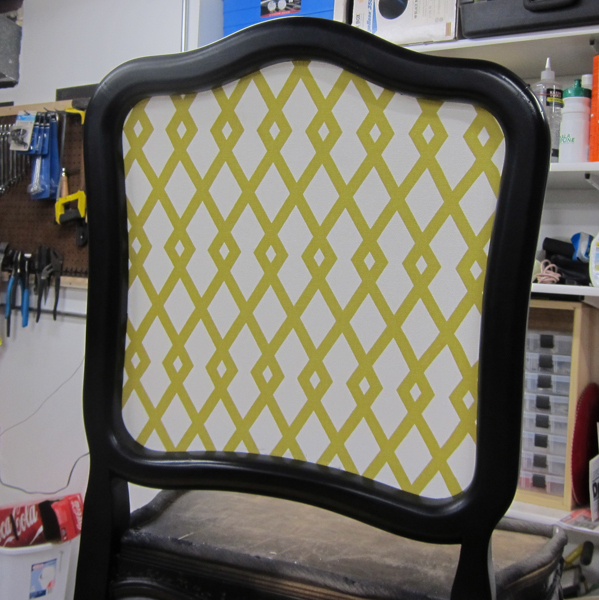 I cut smaller pieces and glued them down around the edges of the chair. Ta da! I felt pretty impressed with myself all things considered. And a pic of the back, of course. And, in the interest of full disclosure? I screwed up a bit, too, but nobody noticed until I pointed it out to them. 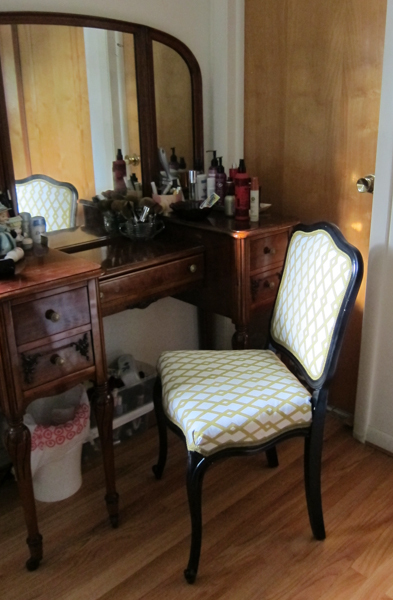 This is the first step in our amazing bedroom makeover (that is nowhere near happening yet). But I like it! Looks great – you two are so handy. Too bad you don’t love closer! Ha!